Silhouette America announced Tuesday in a live Periscope that the beta version of the highly anticipated Silhouette Studio Mobile app will be released on Monday, September 28. The free Silhouette Studio Mobile app will be available for Apple and Android users and can be used on phones and tablets. The beta version of the Studio mobile app will include limited editing functions. Users will be able to open designs, rotate, group, ungroup, add cut lines and access their libraries and cloud storage from the mobile app. 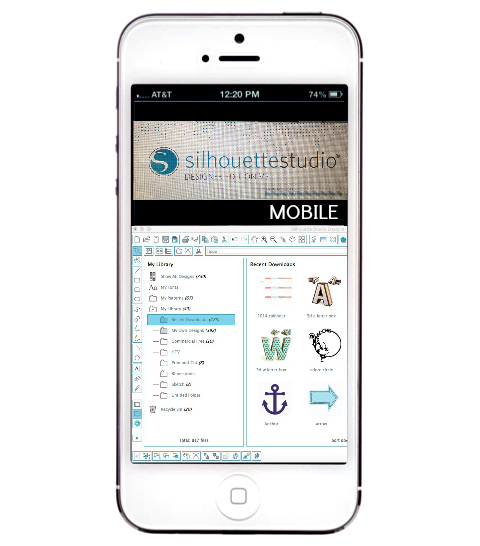 Silhouette Studio mobile users will be able to send designs to cut from their handheld devices, but it's important to know it's not completely Bluetooth and you can't send directly from phone to die cutter. Instead, another device - such as a computer - must be used as a "host" device. That means mobile users can send to cut to their Silhouette CAMEO, CAMEO 2, Portrait and Curio as long as the cutting machine is hooked up to the host computer. Of course you'll also need to be next to your machine to load the mat and material. Future versions of the app are likely to include the ability to add text, freehand drawings, fill with colors and patterns and other basic design features. A firm date on when the full version will be released hasn't been confirmed yet, but SA is hoping for a November or December release date. So, why would I want to do stuff on my phone when I still have to be next to my computer? Any ideas on what the advantage would be? Thanks for getting this info out there! Rachel...if you wanted my periscope I am asking myself the same thing...but people seem to be excited about it! I am excited to be able to draw directly into the studio without a wacom tablet attached to my computer! Now I can whip out my iPad, design, and cut! When u are waiting for appointment you can design or make a kit and when you r at home is only cutting. Your time wasn't waste. The tip that has help me most is - "you don't know unless you try". So many times we talk ourselves out of doing a project because we think it is to hard. You won't know unless you try - and if you fail the first time - it becomes your unique creation - and you still have an opportunity to try again. Thank you for the opportunity!!! That is exciting. I have a lot of downtime waiting for appointments for my job. Now I can design and send and when I get home it will be ready to cut. What a timesaver. All I can say is "wow!" I, personally, cannot see using the mobile app on my phone, but with an iPad, I can definitely envision how great this will be. I am looking forward to it! Do you know which iPads it will work on? You still have to use your computer, so I don't see the point. Why do something on a tiny screen if I have to send it to my computer as well? I might a well just use my computer. How disappointing. The post that helped me the most is how to apply vinyl to canvas! Life saver!!! I am curious, if I have the software on my computer at work, I can not access my library at home. But I will be able to access my library from my phone. Will we ever be able to access the library from another computer? I have down time at work sometimes, and it would be nice to create a project then. and save it and open it at home. Or is this already possible and I don't know how to do it lol. Thanks! I am very excited about the ability to use it on ipad. I keep all my files in a Dropbox acct that I can access from any other computer (unless your work wouldn't allow it to be installed) or my iPad or phone. I can work from any computer that has both Dropbox & Sil Studio! So when I'm at my Mom's house, I can work on designs, and same at work. You don't even have to use Dropbox, could use OneDrive, Box, or any other cloud service. You could also use Google Drive to store your files and be able to access them from multiple locations. It's free! I am exciting about having the software access on my phone but I never understood why the push for Bluetooth for that simple reason of having to load the media. I understand that some tablets do not have a USB so I guess it would be good for that. To me, it's like the Cricut Gypsy. You design on the go and cut when you get home. I love the idea. I hope my Iphone 5S is compatible. I'm disappointed. I thought it would be Bluetooth enabled like the Cricut Explore. I can't wait for this. I am excited to be able to work on my phone or tablet. Anywhere is waiting, for friends ,doctor, flying and more. You can design and when you get back home is just time to cut.your other time shouldn't be wasted. Aw man! I've been totally stoked for this version but it sounds useless if it is as limited as the article says: "Users will be able to open designs, rotate, group, ungroup, add cut lines and access their libraries and cloud storage from the mobile app." That stinks! I think I may save myself the frustration of the limitations and wait until the full version comes out. I haven't been able to find it either.....what would we search under? I've tried everything I can think of? I just tried every conceivable arrangement of the title and it is not available in the App Store for Apple as of today November 13, 2015. Not available in the apple App Store as at today. I wish it could cut directly from the iPad. I wanted to give a Cameo Machine to my mom, as a gift, but she only has an iPad. She doesn't even know how to use a laptop or any device that is not touch screen. I will buy an iPad Pro for myself, and I was considering selling my laptop, because iPad Pro is so powerful and as big as my laptop, but lighter. 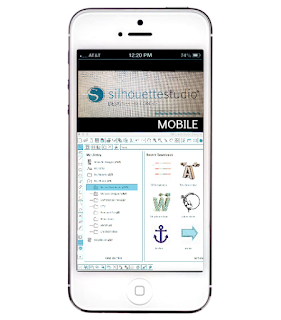 I hope Silhouette makes it possible to cut from mobile devices soon! I can't wait to get rid of the laptop and stick with the iPad only!